AIM, Messenger, and Skype were supposed to have completely ensnared the global population by now. But instead we have a cacophony of comm apps that seems to grow every year: Viber, Tango, Kik, TextMe, TextPlus, Hangouts, Line, QQ, WeChat, WhatsApp, Snapchat, Secret, Whisper, Hipchat, Yammer, Slack, … I find it remarkable that the list of popular apps just keeps growing. Remember: comm apps were supposed to create network effects that would keep users coming back to the most popular apps. New entrants into the space were supposed to face an enormous uphill battle to get any users to “defect” from their existing communication networks. But instead we’ve seen a continuous parade of new (mostly mobile but some desktop/webtop) communication apps launch and grow. If you examine each of the communication apps listed above, you’ll notice that the designers of each app made different choice on these dimensions, below. Each new permutation leads to a novel looking/feeling communication experience and creates a new reason to try out a comm app. Skype is a pseudonymous text/voice/video comm app based on group and 1×1 conversations with reciprocated connections. Facebook Messenger is a real identity text/sticker comm app based on group and 1×1 conversations with reciprocated connections. Secret is an anonymish text/photo comm app based on semi-public unilateral broadcast to friends & friends-of-friends with limited response permissions. There are probably even more dimensions to examine (please leave your thoughts in comments!) — so suffice it to say that communication apps are playing in a (at least) 12-dimensional space that is IMMENSE and has room for tons of innovation. When we think about how large of a design space is available for communication apps, the number of popular apps suddenly doesn’t seem so large at all and it’s actually kind of odd that app developers have limited themselves to a relatively small corner of the available design space (mostly involving text/photo sharing with private groups of reciprocated connections). There’s room for many hundreds more comm apps, each picking out a different and interesting combination of design decisions along these 12 dimensions. I wouldn’t be surprised if there are many more WhatsApp-sized opportunities waiting to be discovered in communication app space. And as the cost of developing new apps continues to drop, my advice to entrepreneurs who are interested in this space is: try to systematically test and probe as many different combinations of the 12 dimensions as you can! If you are working on a novel communication app and you’re running into venture capitalists who won’t give you the time of day because they think messaging is “done”, please ping me on LinkedIn (https://linkedin.com/in/yeeguy) or AngelList (https://angel.co/yeeguy) — let’s talk! I started participating in the Google Glass Explorers program a couple weeks ago and have started to notice some recurring themes/patterns in using a wearable computing device. 1) It’s annoying to people around you if they can’t tell if you’re paying attention to them. Developers of future wearable computing devices should seek to set visible conventions and expectations about when a device is “on” or “off”. It’s really obvious when the user of a smartphone or PC/laptop is paying attention to the people around them vs. the device. Not so with wearables. Google Glass is actually off most of the time, not displaying anything to the user. But the fact that the device is so visibly present in the user’s line of sight makes people around the user wonder what they’re seeing and whether or not the user is actually interacting with the people physically around them or the virtual interface in the device. I’ve wound up adopting the convention of only putting on Google Glass when I’m intending to actually pay attention to the display or when I’m ready to react to Glass notifications (e.g., when I’m working, walking on my own, etc.). When I’m meeting or talking to other people, I’ll rotate Glass up and out of my view, putting them on top of my head like a pair of sunglasses. 2) Most of the apps for Glass (e.g., Evernote, Path, Wordlens, etc.) are single-feature apps and I think this is a bad idea. App developers should think about long-running, persistent computing sessions instead of “micro” sessions. I remember listening to a speech by Phil Libin, CEO of Evernote. He said that his team had been experimenting with Google Glass and other wearable devices and that they had come to the conclusion: “The key difference with wearable vs prior computing devices is session length. You have 1.5 seconds to deliver an experience.” I think that’s a profound statement, but I also think that it’d be a huge mistake for developers to take a big app like Evernote and try to break it up into a collection of individual applets that each have their own unique voice command in the Google Glass navigation menu. Doing so would turn wearable computing into a sort of super-twitchy ADD-riddled cousin of the smartphone experience — where users cycle between a million little applets, one at a time, for 1.5 seconds each. That’s be a looming usability disaster… That mode of app interaction may work for smartphones — because the device is off, stowed in a pocket most of the time, and only comes out for brief bursts of activity. Wearable computing is fundamentally different than smartphone computing. Once I decide to put Google Glass on, it’s going to stay on my face for a while. I’m not going to keep putting them and taking them off as rapidly as I may take out my phone and return it to a pocket. Given that, I’d like to see wearable OS and wearable app developers move towards a paradigm of really long-running computing sessions. I’d like to see Glass constantly record everything all the time and offer all that data to many apps in the background. And then after the apps have processed all that data in smart ways, present back to me the best of what they found. So I just wear Glass and every once in a while I get a notification — “Hey looks like you just were in a cool place, Glass saved 5 photos for you. Want to keep them? [Nod to keep, swipe to review them now, or do nothing to discard in 5 seconds]”. Or “Sounds like you were just having a conversation with two coworkers, here’s a transcription of the meeting notes. Want to save them for editing later?” Each of those notifications could drive a very brief interaction, but the smarts of the interaction are occurring in a persistent, long-running computing session. 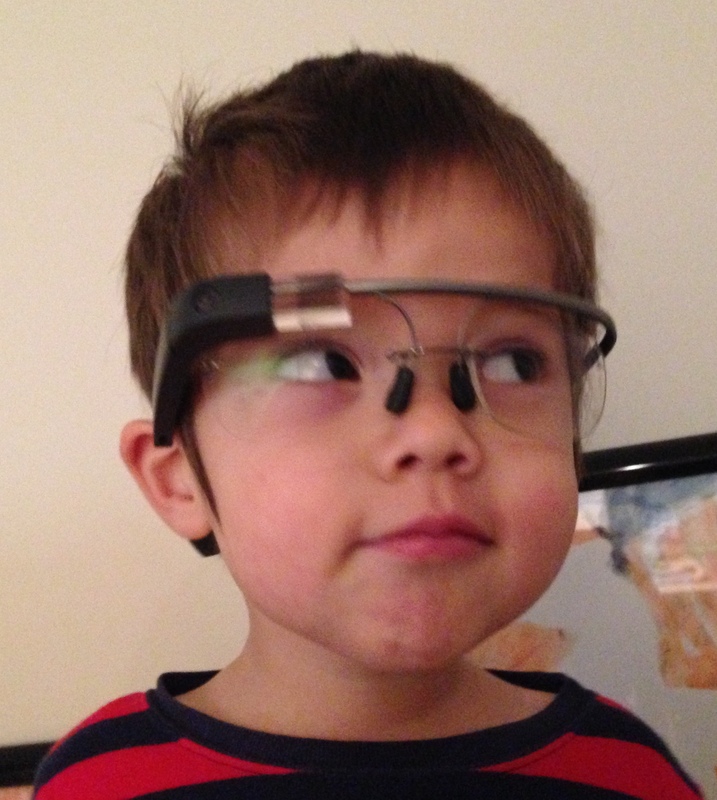 3) When I’m wearing Glass, it becomes the perfect place for realtime notifications that I can take action on. I want Glass to tell me that I should take 280 in order to avoid an accident on 101, or that the milk is on aisle 7, or that rain is expected today when I’m standing at the front door in the morning. A wearable device should know everything about my micro-environment — my location, direction I’m facing, velocity of movement, ambient sounds around me, recognizable visual landmarks in front of me, etc. And if wearable computing has been happening in a long-running persistent session (#2, above), then the wearable OS/apps should also understand the bigger picture of where the current moment fits into my overall day/week/month/year patterns of my life. Apps are long-running, simultaneous, parallel background services that sift through all the data streamed up from the device and generate smart notifications that I can act on quickly or save for later viewing/editing on a smartphone/tablet/laptop. How does Facebook determine the six friends that you see when looking at someone’s profile? Facebook calculates a "social closeness" score for every pair of nodes in its social graph. They use this social proximity score to rank each person's friends and this ranking is reflected throughout the site — it's used for determining which people's posts show up in Newsfeed, which mutual friends are shown on Profile pages, which people's Likes and social ads are shown in the right rail, etc. Since the FB social graph changes every day (e.g., as people add new friends), the social proximity score needs to be updated regularly. There are lots and lots of graph structure and interaction signals that can go into a social proximity score! Note that similar techniques/algorithms are utilized by just about every company that works on social apps and communication products. E.g., Google utilizes this type of scoring/ranking when they suggest email addresses to include in the "To:" line of a GMail message. E.g., Zynga utilizes this type of scoring when they suggest friends to invite to a social game. If you just missed becoming a millionaire or even a billionaire, do you regret it? Of course I regret it, how could you not?! I was at PayPal pre-IPO and had a chance to work with Steve Chen and Chad Hurley. Back then, PayPal's product development process was very Product-driven and as a young PM. I loved that about the place; it was an exhilarating job/experience. When I was getting ready to leave PayPal in late 2005, I remember having a conversation with Steve about product management positions at YouTube. He said, "Y'know, we didn't really like the way product managers and engineers interacted at PayPal. So here at YouTube, we want engineers to lead product decisions. So we kinda just want PM's to take notes on what the engineers decide and make sure that stuff gets done." I mulled that over, thought that sounded terrible, shook my head, and told Steve that maybe we should chat again when he was ready to bring on-board a *real* product manager. I WAS (maybe still am) SUCH AN IDIOT! I had an opportunity to talk with the founders of YouTube about being one of the first (if not the first) PM and I didn't even engage in the conversation because I had held precisely one (1) product management role before in my life and therefore assumed I had it all figured out… Sigh. In hindsight, I think careers in Silicon Valley are so dependent on luck, timing, and who-you-happen-to-know that a lot of us probably have gone through these kinds of near-misses. In fact, I think that's one of the things that makes the Valley special — the business ecosystem is connected enough here that just about everyone knows someone or has a friend-of-a-friend that experienced major personal career success. That proximity to success creates a lot of readily available role models and exemplars that drive the aspirations of the whole Valley. It's not just the top universities, the long tradition of technical innovation, and presence of venture capital or other legal/support functions… Other countries have tried bringing all those factors together into "innovation hubs" and not been able to replicate Silicon Valley. It may be because they're missing the social-connectedness and success role models that we have! I think the regret of a few missed-opportunities is a small price to pay for working in the greatest innovation center on the planet! What are some examples of really good backlogs? Remember: the purpose of a backlog story is just to cause the right conversations between team members. So, it's difficult for an outsider to gauge the "goodness" of a backlog just by looking at the story headlines. Ideally, the conversation about "how" will feedback into the "what" of the story and you may notice that stories with broad scopes get broken down into multiple smaller stories that will each get prioritized. Granular enough that a single individual can implement, e.g., no intra-team dependencies for a single story. Each development team member has a good enough idea of how they would implement the story that they can give a confident estimate. Side note on story estimation: development team members typically are pretty good at estimating story points up to the equivalent of a day's worth of work. Any points estimate that indicates multiple days of work should be taken as a red flag of story uncertainty. High-performing teams will take the time to do multiple rounds of estimation, breaking down stories until they all fit under a low points-ceiling. And if you google around for "public backlog" (in quotes), you'll find other examples. I loved reading about Kapta’s insightful software service that helps organizations align day-to-day actions with strategic objectives and wanted to revisit the topic of SMART objectives that I wrote about back in 2007. I’m going to start using this framework for assessing goals. It’s the start of a quarter… I hope this is helpful for all of you out there setting quarterly objectives and OKR’s!